like a dog with a bone. 1. Committed, tenacious, stubborn, determined, single-minded. Grabbing hold of something and not letting go. This is one of the dog characteristics that can go either way, or both ways: asset, liability, or both. In a letter to the editor of the Chillicothe [Ohio] Gazette, Jennifer McDonald describes Hillary Clinton as being “like a dog with a bone...When she believes in something or someone...she just won't let go.” Ms. McDonald, clearly a supporter of Senator Clinton's failed run for the presidency, intends to say that her candidate is tenacious, a fighter. Critics might agree that the simile applies to Clinton and yet offer different interpretations, e.g., that she is stubborn, doesn't play well with others, cannot give up even on lost causes, or is just plain greedy. So when Queen sings, “You gotta hold on me baby, like a dog with a bone / Don't let go” the simile literally means hold tightly. Figuratively this might seem to be a plea for love and commitment; if you listen to the full lyrics, this interpretation may instead seem ironic. It may be useful to consider this simile in relationship with the phrase “dog in the manger.” That dog selfishly hoards something for which he has no need. 1. McDonald, Jennifer. 2008. Clinton Cares About the American People. Chillicothe Gazette, Feb 29. Accessed Apr 18 2008 from http:// www.chillicothegazette.com/ apps/ pbcs.dll/ article?AID=/ 20080229/ OPINION/802290321/ 1014. 2. Hudson, W. H. 1918. Far Away and Long Ago; a History of My Early Life. New York: E.P. Dutton & co.
3. Queen. 1988. Dog with a Bone. Acccessed Mar 13, 2008 from http:// www. ultimatequeen.co.uk/ Songs/ unreleasedqueen.htm #dogwith. However protective one is of what one has, it seems there is always more to have. Aesop's fable, “The Dog and the Bone” (sometimes called “The Story of the Dog and his Shadow”), describes a dog who was carrying a bone over a bridge. As it crossed, the dog saw its own reflection—and the reflection of the bone!—in the water. 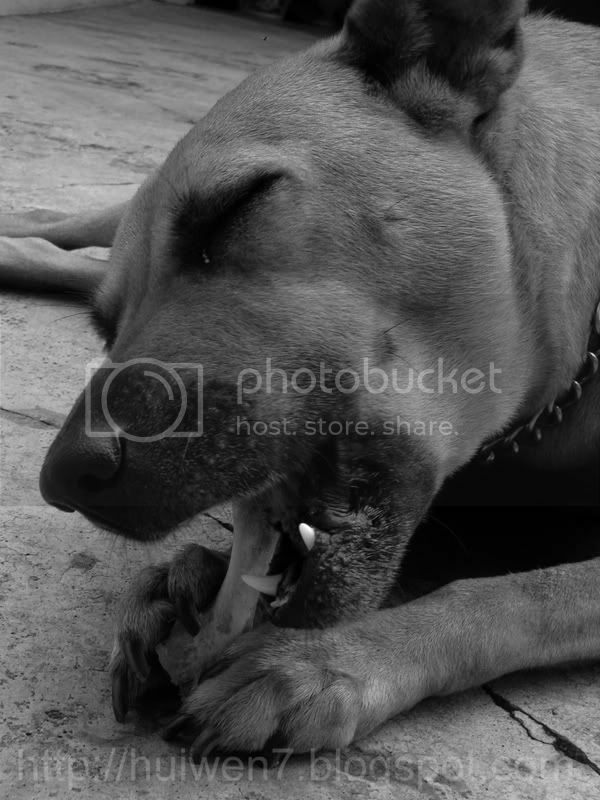 Wanting this “other” dog's bone as well as its own, the dog opened its mouth to bark at this rival. In so doing, the dog dropped the bone into the river, where it was gone for good. Don't be greedy, is the moral of this tale. Or perhaps, a dog is unable to distinguish its own reflection from that of another dog. Or maybe it's just that dogs, and those who act like dogs, can be selfish and greedy. 5. Aesop and Milo Winter. 1947. The Aesop for Children. New York: Checkerboard Press. About the illustrations: Figure 1 is by Hui Wen and is used under Creative Commons license 2.5. Figure 2 is by Milo Winter, painted for the story of the dog and the bone. © 2008 Jupiterimages Corporation.